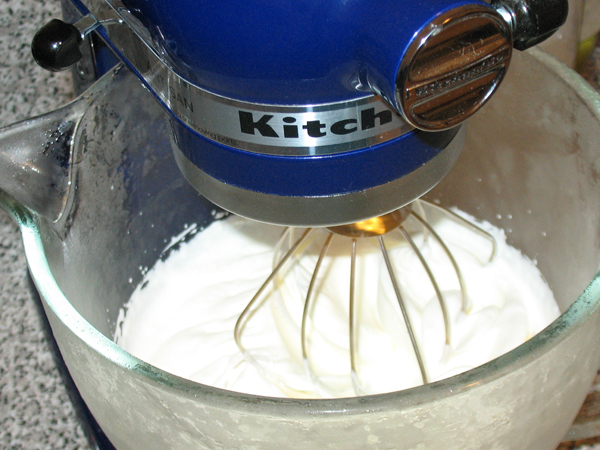 Yes, it’s officially too hot to do anything else besides make whipped cream. Toronto is under a heat and smog alert, but I, dear reader, ventured forth into that humid desert to find some strawberries and heavy cream, to make the only thing I could think of which doesn’t involve using the stove. 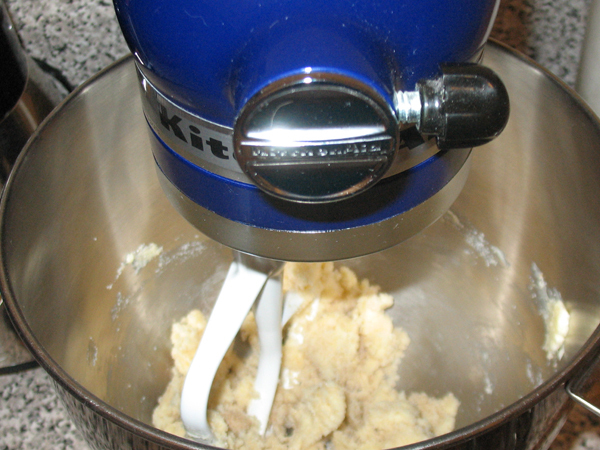 Whip the hell out of it in your awesome mixer. Go Nemo go!! And once the cream reaches the desired consistency (like 40 seconds or something ridiculously short like that), it’s ready! Hopefully you have somebody you can convince to wash, dry, and hull the berries for you. Yum. 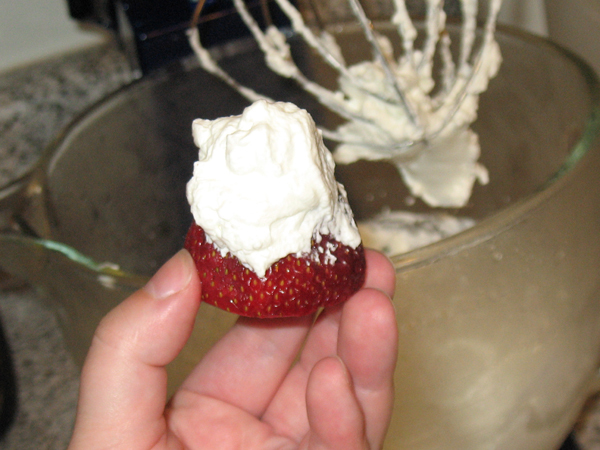 I think I am going to make strawberry shortcake next time. After we ate some berries, I decided the time was ripe to convince Boyfriend that we really need the ice cream maker attachment for Nemo. There are people who accessorize their home, and there are people who accessorize their pets. I just want to accessorize my beautiful appliance. Did I succeed? Stay tuned. Goblin King! Be still my heart. This recipe comes from KitchenAid 3 cookbooks in 1 which is available on Amazon.com I bought the book for this recipe in particular actually, have been waiting for months for June 13 to roll round so I could try this out. 1. 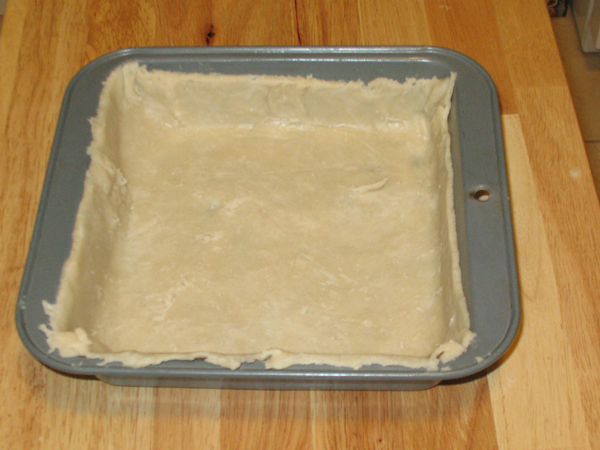 Pre-heat oven to 176°C / 350°F. 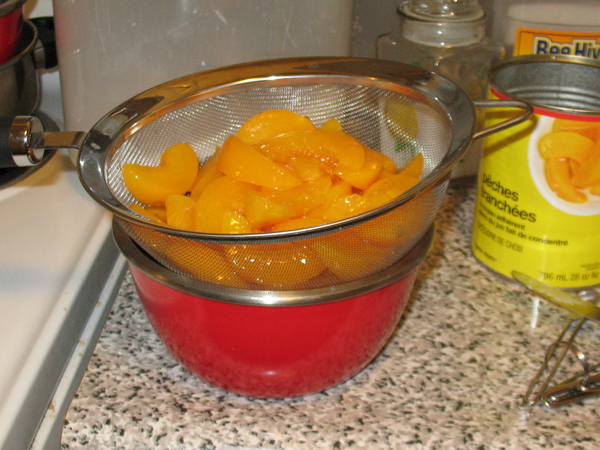 Drain peaches and save the syrup. 2. 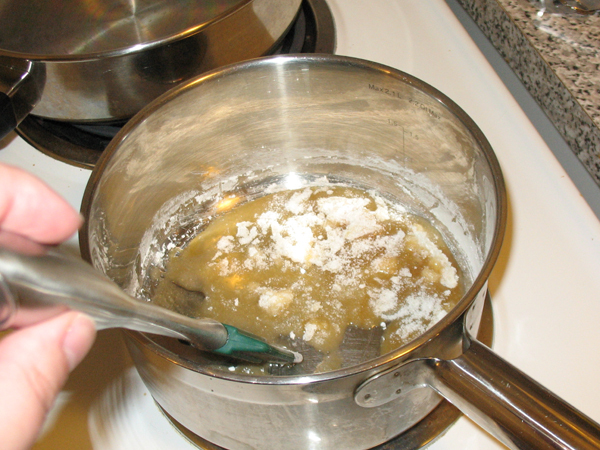 In a sauce pan on low, heat white sugar (all except the 1 TBSP) and corn starch. 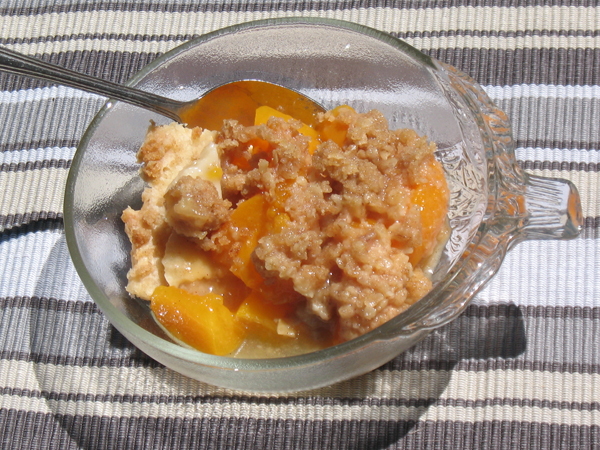 When it melts, stir in ¾ C of the peach syrup, adding it gradually. 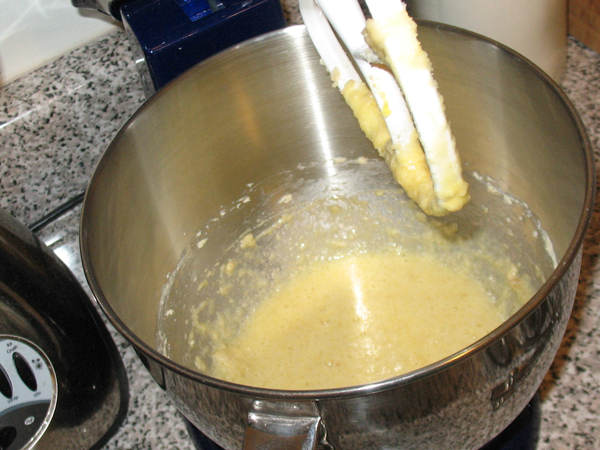 Keep mixture on low for 10 min, it should thicken. 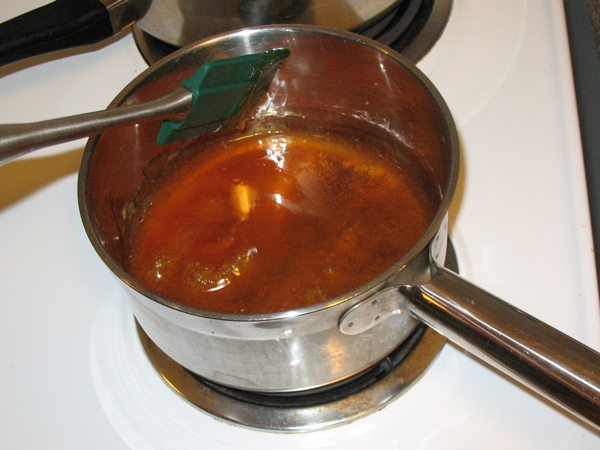 Remove from heat and add vanilla. Set aside. 3. 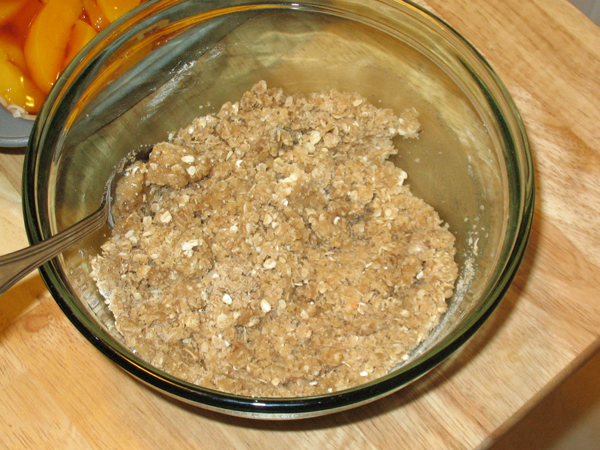 Combine in a bowl: brown sugar, ½ C flour, oats, and cinnamon. 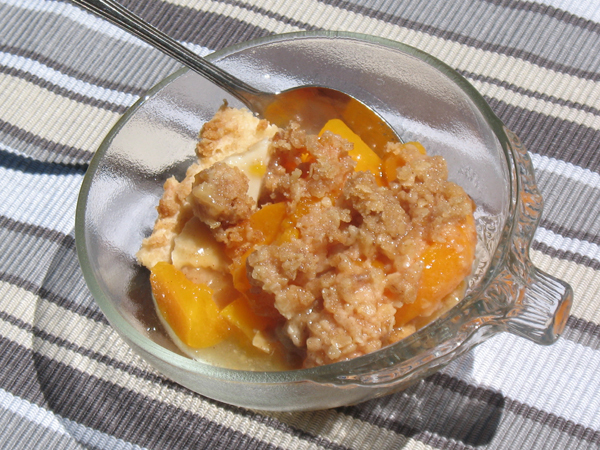 Stir in melted butter and you’ll have a crumbly topping. Set aside. 4. 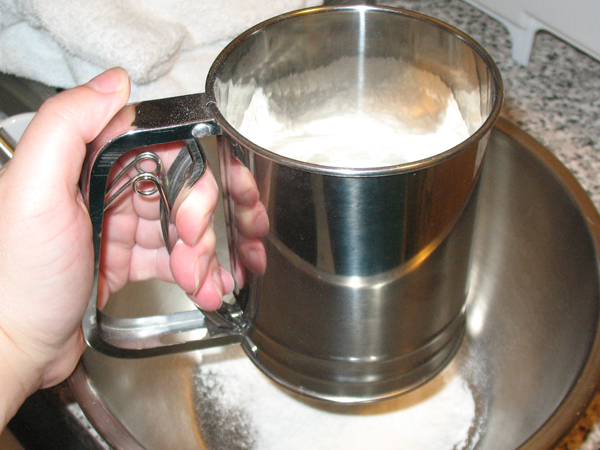 Combine in a bowl: remaining 1½ C flour, 1 TBSP sugar, and salt. Cut in shortening. 5. 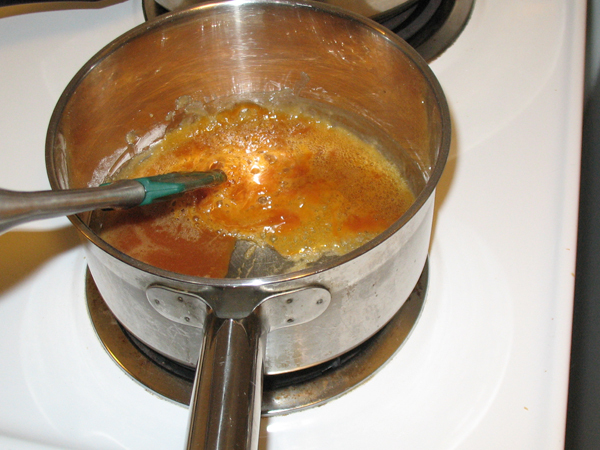 Add water one tablespoon at a time and mix with fork. 6. 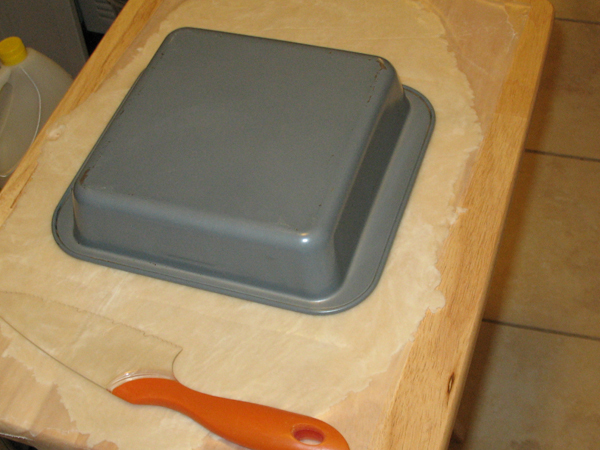 Roll out crust until it measures 10″ square. I rolled it out between two layers of wax paper. 7. 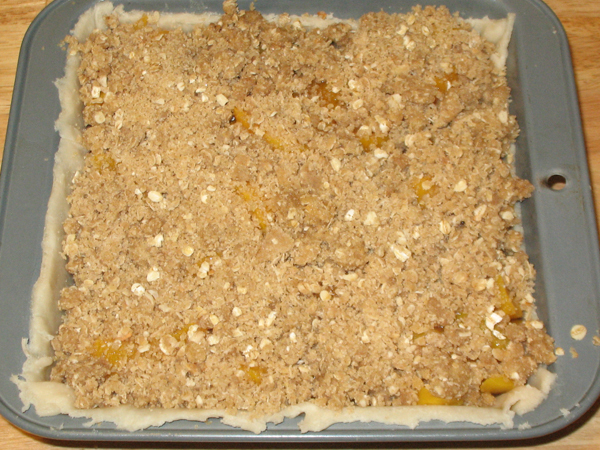 Trim away excess and press crust into pan. 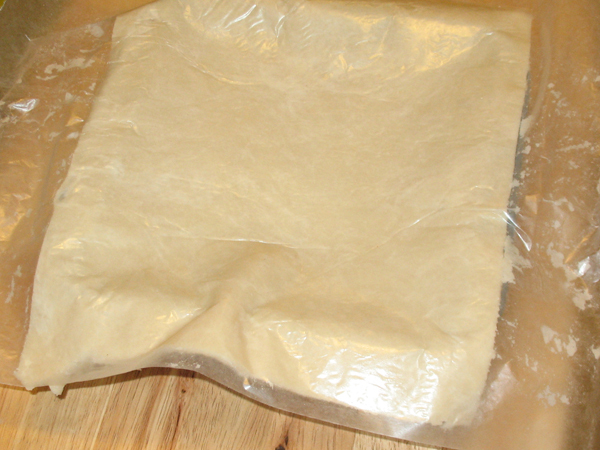 Peel off wax paper. 8. 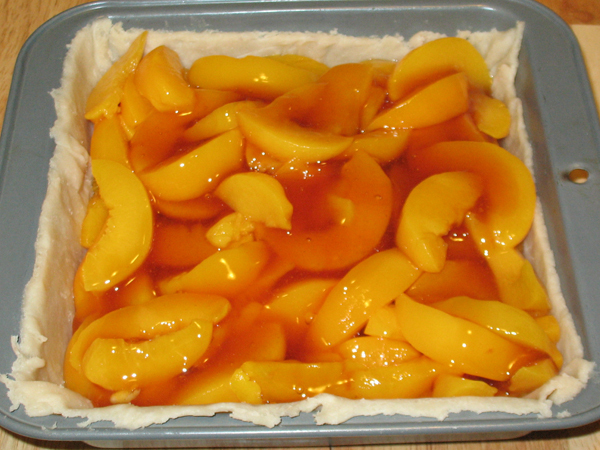 Drop peaches onto crust, add warm syrup, add topping. 9. 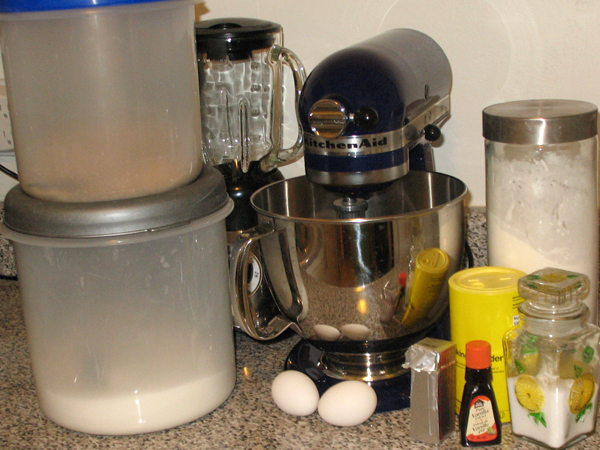 Bake 45 min. Cool on wire rack. The book says to serve warm. I tried one piece last night warm, and one piece this morning. I liked it better the next day. Verdict: I liked this. 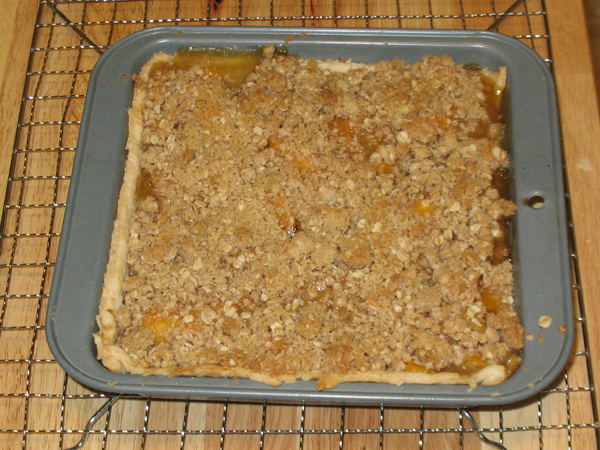 I imagine with fresh peaches it would be extra good, but after what happened on Labyrinth Day 2011 I couldn’t be bothered. My big plan was to post this last night at the 13th hour (1am), but I got sleepy. I intended to send Boyfriend into work with some but I was enjoying a pleasant dream about Jareth and I didn’t get up in time. 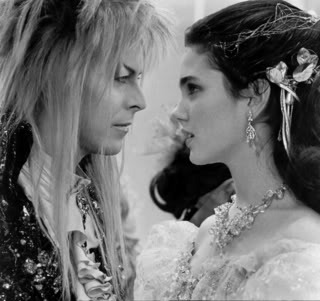 Goblin King, you can peach me away anytime. 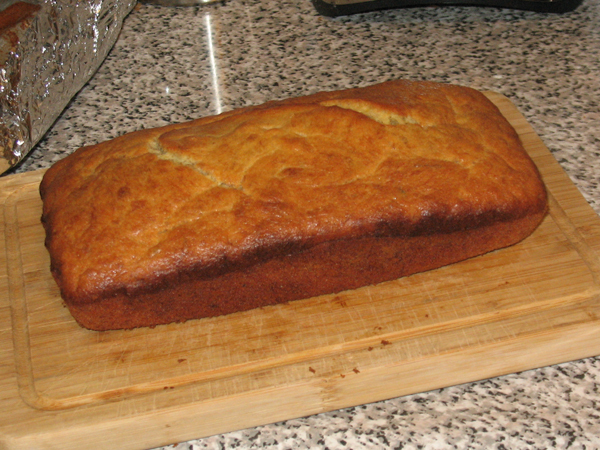 If it’s shaped like banana bread, and it smells like banana bread, but looks nothing like banana bread, is it banana bread? That is the question. 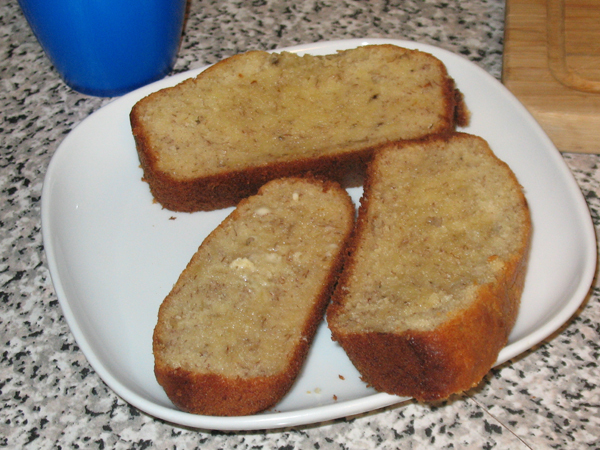 My failure to make a perfect tea bread came up with Best Friend the other week. Okay, I thought. Obviously my attempts to re-create family recipes isn’t working, so what do the pros do? 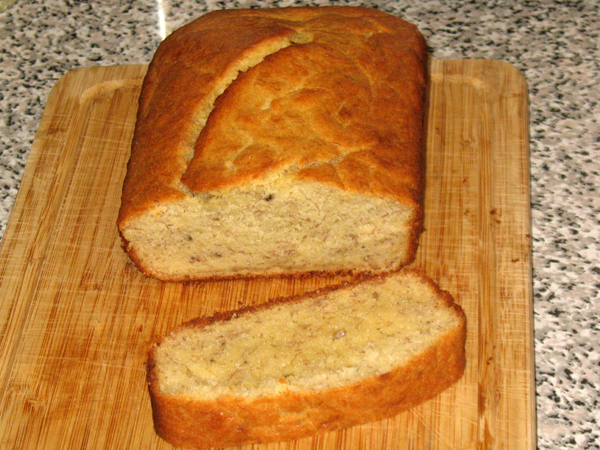 I found this recipe in KitchenAid 3 cookbooks in 1: pies & tarts, cakes & cupcakes; breads which is available on Amazon.com and while it seemed pretty straight forward, I’m still not sure I have real banana bread. You may be wondering why there are no bananas in this picture. Well. 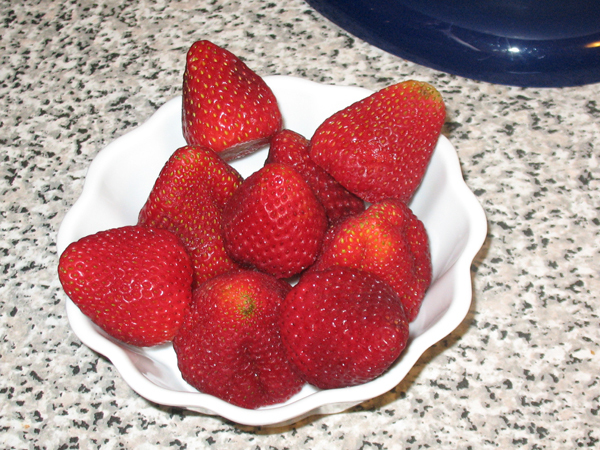 They uh… seemed over-ripe, almost to the point of “Should these be tossed out or are they still okay?” and I decided they looked too scary for the shot. 1. Pre-heat oven to 176°C / 350°F. 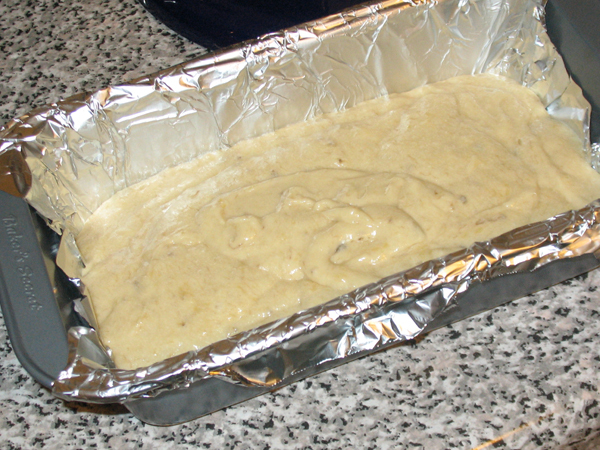 Line pan with tinfoil and grease. 2. 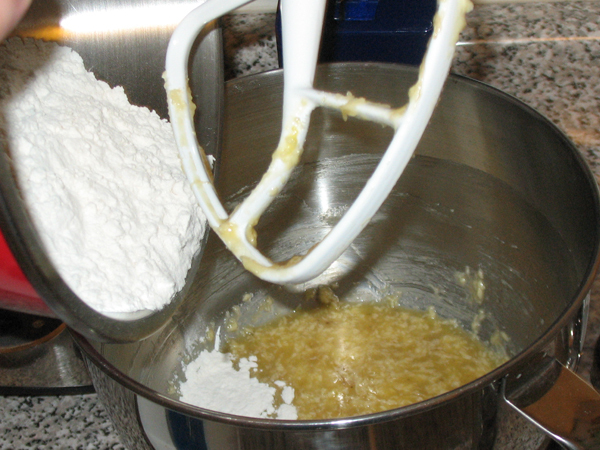 Cream butter and sugars in mixer until light and fluffy. 3. 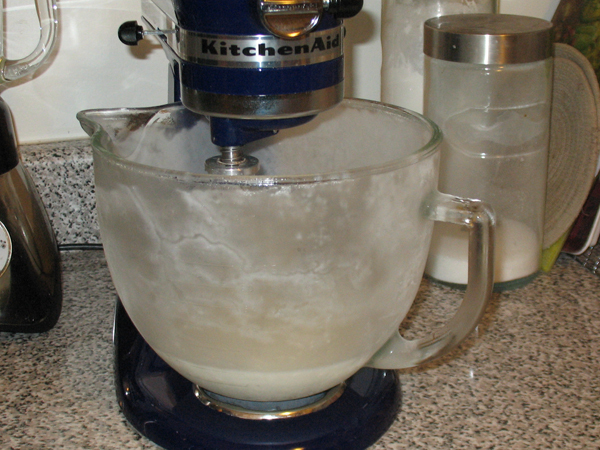 Add eggs one at a time, then add bananas and vanilla. You’re supposed to mash the bananas first, but uh… mine had reached the point of cellular degeneration where mashing was no longer required. 4. 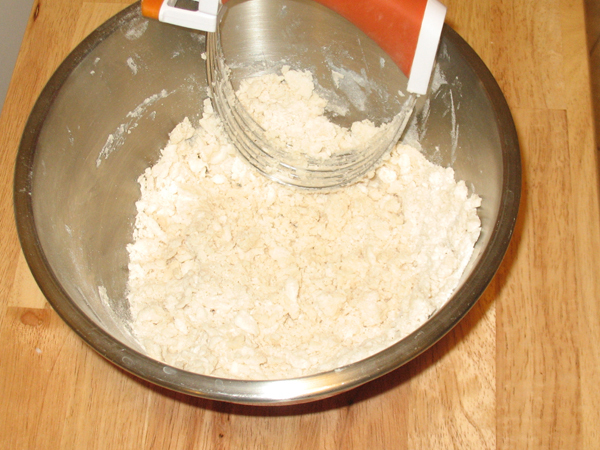 In a bowl sift flour, baking powder, and salt. 5. 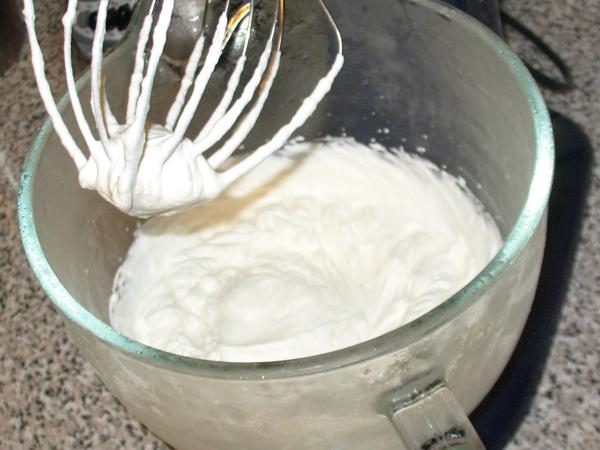 Add gradually to wet mix and mix until just combined. 6. Spoon batter in pan and bake 50 min. 7. 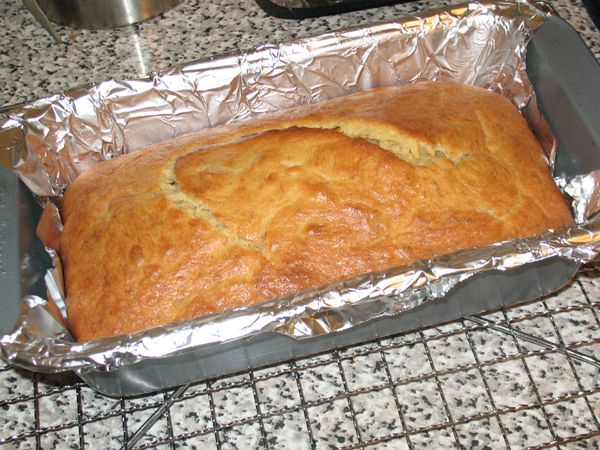 Remove from pan and set on wire rack, cool in pan for 1 hour. Toothpick test indicated doneness. 8. 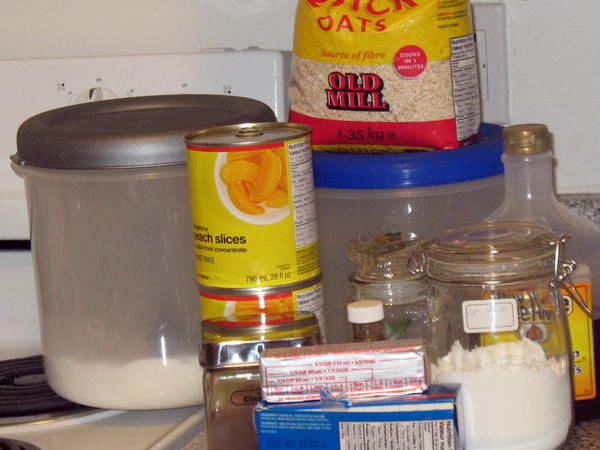 Remove foil and slice.